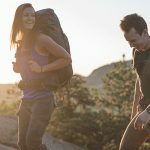 The Mountainsmith Ghost diverges from the traditional top-loading design, yet performs very well in comparison to other backpacks in this category. The Ghost’s overall comfort, ventilation, storage options and very low price set this pack apart from many others in this category. If there were an incorporated rainfly and seam taped zippers, and this pack would be at the top of my list. The Mountainsmith Ghost does have the traditional storm flap top entry and a lid, but instead incorporates two zippered compartments, much like a suitcase (or a school backpack). I found that this did not hamper the storage capabilities of the pack, since it contains a zippered front panel pocket, with a seam-taped zipper, that takes the place of a lid pocket. Two large zippered U-shaped access points provide access to the interior of the pack, allowing access much like a suitcase. The Ghost comes with two stretch hip-belt pockets that provide excellent storage and the two side stretch side mesh pockets are very deep. They not only swallowed 1-liter bottles, but allowed easy access on the fly. The Mountainsmith Ghost was one of the most comfortable packs tested to date in this category. This pack performs very well with loads up to 40 pounds. 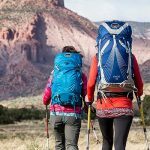 The pack’s many built-in comfort features, and the pack’s adjustment features—which to transfer weight from the shoulders to the hips and tailbone—worked cohesively. The Ghost incorporates a thick air-mesh foam in the hip-belt, which provides good padding and great comfort. The hip belt also provides a large lumbar support padded area that was not only comfortable, but seemed to help transfer the weight onto my hips and tailbone area for increased comfort. The Ghost comes with thicker padding then most backpacks in this category on the shoulder straps, which make these straps very comfortable with weight up to 40–45 pounds. The “Breezeway” back panel provides the best airflow of any pack in this category. This airflow really accentuated the comfort of this pack in warmer weather, or highly aerobic activities in the colder months. The Mountainsmith Ghost is stable and performs well carrying loads in the 30- to 40-pound range. The pack did not shift or float on me regardless of the terrain, or occasional scramble. I did discover that when carrying loads in the 45-pound range, the pack did begin to float (although it was still functional). The Mountainsmith Ghost proved tough and durable in a variety of weather and terrain conditions. The main compartment zippers were not seam taped, so wet weather protection is minimal.